Site Event can supply luxury disabled loo hire, for the disabled as well as able bodied and parents requiring a baby changing facility. Finished in white, the trailer can be incorporated with other units in our range without standing out. The luxury finish on the toilet trailer ensures every person at your event has luxury toilet hire. The trailers contain handrails and the washing facilities are placed at a low level, therefore allowing maximum user-friendliness. Complete with towing frame, these disabled trailers are highly portable and ideal for events where wheelchair accessibility is essential. The bespoke trailer is entered via a long, shallow angled, drop down ramp. With safety very much in mind, we have added ‘non slip’ strips on the slope as well as an easily removable set of hand rails, which are stored externally on the unit. The wheelchair user can gain access easily from this point by a wide, internally opening door. A skirting board fully surrounds the internal space, as well as a dado rail separating the marbled effect wall finish from the floor, which is finished in a complimentary ‘easy wipe’ grey vinyl. A long vanity unit topped in a black granite effect melamine runs along the right of the unit. This contains an inbuilt porcelain sink and mixer tap, space for paper towels and soap as well as a large surface area to rest any other items. Above this is a large mirror, a separate grab handle at this point is provided. On the opposite wall is the wall mounted, purpose built, fold down baby change shelf. The toilet itself is porcelain, with a close coupled cistern. As with all disabled toilet facilities, we provide both the hinged foldback rail as well as the fixed grab rail at the side of the loo. In case there is a problem of some sort, the red emergency cord, at the side of the toilet can be pulled to alert people outside. 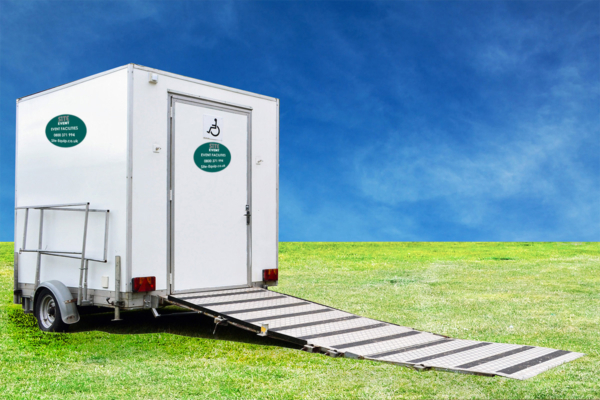 The towable luxury disabled loo hire can be manoeuvred to any location where the ground is level and there is a power supply. Our disabled units can be delivered around the South of England including Hampshire, Berkshire, Dorset, Essex, Kent, Wiltshire, London, Surrey, Sussex, Buckinghamshire & Oxfordshire. If you’re further afield then please do not hesitate to give us a call and we will see what we can do!